Go To Team cameraman John Riley has been in Charleston, South Carolina, Houston, Texas, and now CLEVELAND, OHIO! Cleveland, Ohio cameraman has a passion for telling stories in the most intriguing and visually captivating way possible. Using lighting and camera movement to convey emotion, excitement, and to enhance a story is what he does best. John has been honing his skills and knowledge the last few years. 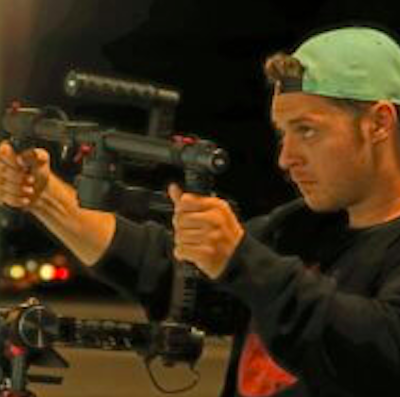 His love of all things video related has brought him to work for clients such as the NFL Network for the Super Bowl, No Studio Entertainment for DIY, NBC News & ABC News, Volvo, The Weather Channel, and many more. Finding a special look and feel that best tells the story keeps him a cut above. His dedication and love for his craft set John apart. “It’s about passion.” He sees difficult situations as opportunities to innovate not as something to fear. So if creating a specific, unique, and memorable piece is the goal, John is your go-to guy. GTT: What’s been your favorite shoot so far at GTT? JR: The Veteran’s Inaugural Ball in Washington, DC, a charity shoot for Songs for Sound. GTT: What would you dream shoot be? JR: A feature that I write, direct and shoot. GTT: What is your favorite thing about your market, Cleveland? JR: Close to family and friends. This is where I’m from! GTT: What is your favorite part of being a cameraman? JR: The variety of shoots and people to work with. GTT: What celebrity would you most like to meet? GTT: What’s your dream city to visit? GTT: What advice would you give your 18-year-old self? JR: Don’t lose track of your artistic voice. Keep it sharp. Ready to Book with John?